Dominik Elmiger joined LALIVE in 2015. He specialises in domestic and cross-border litigation in civil, commercial and corporate law. He also has experience in economic criminal law proceedings, debt recovery and insolvency proceedings as well as enforcement proceedings. Dominik Elmiger is a member of the Zurich Bar Association (ZAV) and the Swiss Bar Association (SAV). 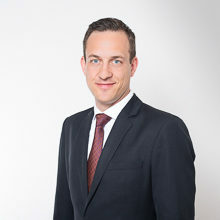 Prior to joining LALIVE, Dominik Elmiger worked as an associate in the dispute resolution team of a leading law firm in Zurich (2011-2014) and trained with a well-known Zurich law firm (2007-2009). Dominik Elmiger holds a Master’s degree from the University of St. Gallen (M.A. HSG in Law, 2007) and a Master of Laws (LL.M., 2015, with distinction) from University College London (UCL).